Can You Move the World? 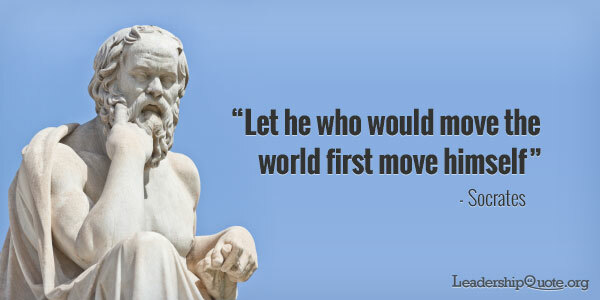 What does Socrates mean by the word “move” in this profound quote? The easy answer is to translate the word “move” into the word “change”. That may be easy and you can interpret his quote in that way. I prefer to read the word “move” as “produce emotional reaction in somebody”. What does it mean when Socrates says that if we want to produce an emotional reaction in the world, we must first produce that emotional reaction in ourselves? What does Socrates know about irony? It is ironic that all the new thinking around the brain function, decision-making and logic should be so accurately reflected in the quote from Socrates which is the headline of this article. We now understand that 2,500 years of belief about the way to enquire and debate was flawed. I was trained in the fundamentals of selling using the classical selling methods, developed mainly in the US during the 20th century. I learnt from a master salesman, a true professional who would never have been called pushy -and he was good, very good. I didn’t realise what it was called at the time but I modelled him. That means that I copied him and tried hard to learn what he did. That meant copying his processes and that was what gave me the structure to learn to sell. You probably know this stuff. Prospecting, door-knocking, using the alternate close to make the appointment. Then, going on to presenting, working through the process. Next is the handling of objections. Part of it was to use the logical left brain to prove rationally to the prospect that it was obvious that they should buy the product. Sometimes we used the tool which we called the Winston Churchill close and which I believe the Americans call the Benjamin Franklin close. This involves helping the prospect to list the reasons to buy and then letting the prospect list the reasons not to buy. All very logical stuff, all very “left brain”. This was all wrapped up in my passion and conviction for the product. A lot of my passion and conviction came from the fact that I was taught about the product by the master salesman. Because the passion for the product came over and because I had stories about how it was made and how it had solved problems for people, I was able to relate directly to the prospect’s problems and they were able to relate directly with me and with the product. Of course, I didn’t know at the time that I was actually relating right brain to right brain and engaging the primitive reptile or limbic brain of the prospect. Over the last 15 or 20 years, there have been some huge strides in the understanding of the way that our brains work. What we now know is that all decision-making goes on at a level beneath our logical brains. Socrates certainly couldn’t have known that and neither could my master salesman mentor. However, they did know instinctively and by logical deduction that emotions are the way to move people. And this is how we can “move the world,” so to speak, from the mouth of Socrates himself in the leadership quote above. The irony for us is that Socrates was right(!). If we as leaders (or salespeople or in fact, anybody else in any walk of life) wish to influence other people’s decisions – shall we say “move” them – we must first move ourselves. We must believe and be passionate about what we want first. We must learn to tell our stories with deep feeling and emotion and then we can move the world.